More Football, more injuries. One of life's unfortunate truths, right up there with income taxes and death. If your fantasy football team has managed to avoid the grim reaper and is smack dab in a playoff matchup this week, congratulations. Conversely, if you're playing for pride in that consolation bracket (hey there...), there is at least something at stake. So get that roster of yours ready and get your mind right as we walk through the week 15 edition of our fantasy football injury report. - The Bengals lost QB Andy Dalton to a fractured thumb in week 14. Dalton, who was replaced by AJ McCarron, fractured the thumb on his right, throwing hand. Dalton's hand was heavily taped and padded as he watched from the sidelines. As of Monday, Dalton was labeled week-to-week, with the good news being that he does not need surgery on the thumb. McCarron should continue to start. TE Tyler Eifert left with a concussion and did not return. 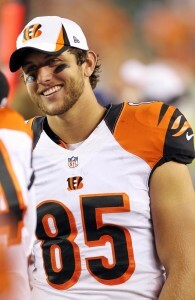 Eifert had been dealing with a back injury in the buildup to week 14. Eifert will be in the concussion protocol over the next few days. - Ravens TE Crockett Gillmore (back) did not play in week 14, nor did QB Matt Schaub (chest). They were replaced by Maxx Williams and Jimmy Clausen respectively. - Patriots TE Rob Gronkowski returned from a knee injury in week 14. RB LeGarrette Blount left the game in Houston with what was reported as a hip injury. Brandon Bolden and James White absorbed the work in Blount's absence. - Bills TE Charles Clay left his team's week 14 game with a back injury. Clay was replaced in the lineup by Chris Gragg. RB Karlos Williams (shoulder) remains week-to-week and has yet to resume practicing. - Panthers TE Greg Olsen suffered an injury scare in week 14 when he left with a knee problem. Due to the Panthers' resounding performance against Atlanta, Olsen was able to sit out the rest of the game. Coach Ron Rivera said Olsen could have returned to the game, but was withheld for precautionary measures. Olsen may be rested a day or two during the week of practice ahead, but should be good to go in week 15. - Bears WR Marquess Wilson will miss the rest of the year with a foot injury. TE Martellus Bennett has also been placed on season-ending injured reserve due to the rib injury that had kept him sidelined recently. Zach Miller is now firmly in the TE1 discussion. - Browns WR Brian Hartline (collarbone) is out for the season. Cleveland's receiving corps is in tatters at the moment, with both Taylor Gabriel and Andrew Hawkins dealing with concussions, and Hartline on the shelf. Dwayne Bowe and Terrelle Pryor will join Travis Benjamin to form a makeshift group against Seattle in week 15. Gabriel has returned to practice and could play. Tyler Eifert left in week 14 with a concussion. - Lions WR Lance Moore missed week 14 with an ankle injury. Moore could be a sneaky sleeper play against the Saints -- his former team -- if he can go in week 15. Meanwhile, TE Brandon Pettigrew is done for the year with a knee injury. - Texans QB Brian Hoyer left his team's week 14 game with a concussion and strained neck. Hoyer was injured late in the fourth quarter and did not return. He was replaced by T.J. Yates. Hoyer missed week 10 with a concussion, and will likely be spending the next few days in the league's protocol for head injuries. The Texans have a massive week 15 matchup with Indianapolis. - Colts QB Matt Hasselbeck left his team's week 14 loss with a rib injury. This news comes right as the Colts are anticipating the return of Andrew Luck (kidney, shoulder) in week 15. Luck had been expected to return to the lineup in a big game against the Texans, though coach Chuck Pagano left the door open for the veteran Hasselbeck to remain under center provided he is cleared. Luck may still need more time to get back into game shape. - Jaguars RB T.J. Yeldon left his team's week 14 game with a knee injury. The suddenly-relevant Jags will be hoping that the rookie's injury is not serious, having already lost Toby Gerhart for the year. - Chiefs RB Spencer Ware left his team's week 14 win over San Diego with a rib injury. Ware was able to return briefly before exiting once more. He was replaced by Charcandrick West. - Jets WR Devin Smith left his team's week 14 win with a serious-looking leg injury. Smith was carted off the field and did not return. On Monday, the team placed him on season-ending injured reserve with what was officially diagnosed as a torn ACL. 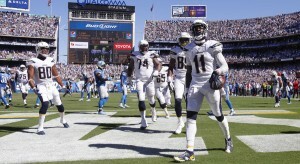 - Chargers receivers Stevie Johnson (groin) and Dontrelle Inman (neck) both missed week 14. Both players should have a better chance to suit up in week 15 after a full week of rest. - Seahawks RB Thomas Rawls (broken ankle) will miss the rest of the year. Rawls will not need surgery, but will require several weeks of recovery time. The 'Hawks are already without Marshawn Lynch (abdomen), so veteran Fred Jackson will be a popular waiver wire add this week. DuJuan Harris and Bryce Brown will be two more names to monitor. The best-case scenario for Lynch's return looks like week 16. - 49ers TE Vance McDonald (concussion) missed week 14. Blake Bell got the start in his absence. RB Carlos Hyde (foot) was placed on injured reserve earlier in the week and will miss the rest of the season. Shaun Draughn will continue as the team's lead back. Stevie Johnson hopes to return from injury in week 15. - Rams rookie RB Todd Gurley sat out the fourth quarter of his team's week 14 game with a knee injury. Gurley reportedly banged his knee, and according to reports, the injury is not considered serious. - Buccaneers WR Vincent Jackson left his team's loss to the Saints in week 14 with a knee injury. VJax has already missed multiple games this year with a similar injury. With Tampa playing St. Louis on Thursday, Jackson looks like a longshot to play. It is believed that he has an MCL sprain, which could keep him out indefinitely. Adam Humphries saw extra work in Jackson's absence. - Dolphins TE Brandon Williams has been ruled out for the rest of the year with a foot injury. Miami placed the athletic specimen on injured reserve on Monday. - Giants TE Larry Donnell was placed on season-ending injured reserve with a neck injury last week. Coach Tom Coughlin is optimistic that Donnell's injury will not be a long-term concern. - Titans wideout Kendall Wright (ribs) did not play in week 14. Wright should be considered week-to-week. - Redskins TE Derek Carrier was carted off of the field in week 14 with a knee injury. Carrier's injury leaves the team thin behind injury-prone starter Jordan Reed. RB Chris Thompson (shoulder) has a torn labrum and could miss the rest of the season. The Bucs and Rams will release their initial injury reports on Tuesday, with the rest of the league following suit on Wednesday. Good luck in week 15.